Carex collinsii perennial 20-60 cm tall, stems densely tufted, very slender, weak, longer than leaves. Leaves alternate, blades 0.2-0.4 cm wide. 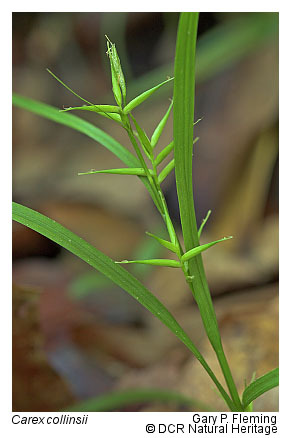 Flowers: male spike at top of stem, 0.5-1 cm long; female spikes 2-4, widely separated; female flowers (perigynia) 0.8-1.2 cm long, tapering, beak teeth conspicuous, bent outward; achene bluntly 3-sided; inflorescence sparse; bracts leafy, sheathing at base, longer than inflorescence; blooms and fruits June-Sept. Frequency in NYC: Rare (G4; S1S2; R). Habitat: Usually in Atlantic white cedar bogs, a pine barrens plant.